Home » Health » What Is Black Spots? Black Spots or Ephelis are flat spots on the skin of the face that are formed due to increased melanin or natural skin pigments. Black spots can also appear on other body parts, such as the arms, chest, or neck. These spots tend to be easily seen and easily appear in people with white skin. Black spots are a common condition at all ages and usually do not harm or cause pain. Black spots appear due to increased production of melanin, especially after exposure to sunlight or ultraviolet (UV) rays. Melanin is a pigment that determines the color of the skin, eyes, and human hair. The part of the skin that has a lot of melanin will be darker than the surrounding skin, so it looks like spots. Increasing melanin in a person's body is also related to genetic factors. People with white skin and have blonde or red hair experience this condition more often. Although most spots are black, this does not rule out the possibility of appearing in other colors, such as redness, yellowness, or brownish depending on each person's skin pigments, but which are definitely darker than the surrounding skin. Are You Know : What Is Dystonia? Black spots on the skin will look like patches or dots of darker color than the surrounding skin and not protruding (flat). Black spots are generally painless, harmless to health, and cannot turn into cancer. Black spots or ephelis do not appear on skin that is not exposed to sunlight. Some dangerous diseases that need to be watched out for because there are similarities with ephelis or black spots are neurofibromatosis and melanoma . Therefore, it is better to be aware of the spots or spots and immediately see a dermatologist to recognize and get the right diagnosis. Skin tests and biopsies will generally be performed to determine the diagnosis. Whitening cream. This cream is generally used to fade black spots and can be purchased freely. However, creams containing hydroquinone require a doctor's prescription. Ask your doctor if you experience side effects such as skin inflammation, dry skin, feels like burning, discoloration of the skin, or peeling. Retinoid cream. This cream that contains the chemical compound vitamin A can be used in conjunction with whitening creams and serves to fade black spots in a matter of months. Some examples are tretinoin , tazarotene, and side effects that might occur due to the use of this cream are reddish, dry, irritated, sensitive, and flaky skin. Laser therapy. 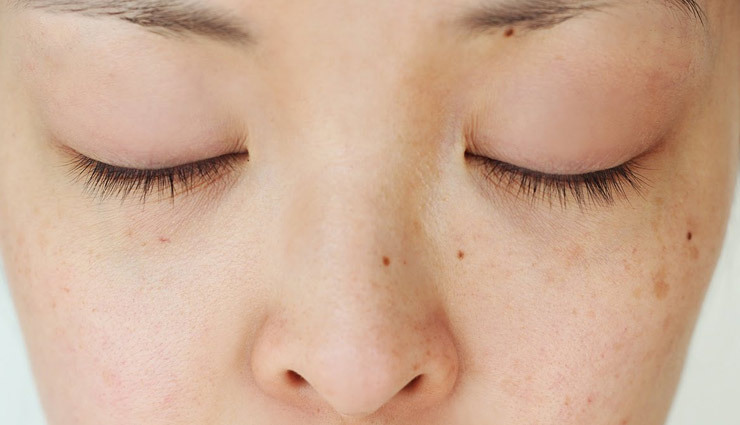 This therapy uses light waves aimed at the problematic skin. Studies show that the laser is able to fade black spots up to 50%. Although safe, some side effects that might occur from this treatment method are skin itching, redness, swelling, infection, flaking, or changes in skin color. Peeling . The peeling action uses chemical liquids containing glycolic acid (GA) or trichloroacetic acid (TCA) which functions to remove damaged skin cells and create regeneration. Some of the effects that can occur from this treatment method are the skin feels sore and red, irritation to the skin, swelling, and skin peeling. Cryosurgery. Cryosurgery is the act of removing black spots using low-temperature liquid nitrogen to freeze and kill abnormal skin cells. Although safe, it should be noted that not all types of spots can be treated this way. Some of the side effects that are at risk are blistering, hypopogmentation, and bleeding. Use sunscreen with SPF 30-50, especially for those who have white skin. Avoid outdoor activities between 10 am and 4 pm, because UV exposure is still very high. Use protection such as hats, long sleeves, and other covers when outdoors. 0 Response to "What Is Black Spots?"